DJ Idris Elba is getting the crowd hyped! 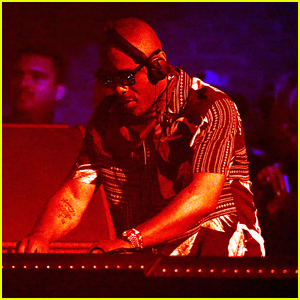 The 46-year-old Lucifer actor and DJ made his Coachella debut at 2019 Coachella Music Festival on Saturday (April 13) in Indio, Calif.
Idris sported a patterned shirt and sunglasses as he delivered a DJ set for the festival crowd. Although this was his first time at the festival, he’s DJed plenty of times before in the past – including Prince Harry and Meghan Markle‘s wedding! “Harry came to a couple of parties that I DJed and he was like, ‘What are you doing on [May 19]‘ and I told him nothing and then he asked if I would DJ at his wedding,” he told Ellen DeGeneres earlier this year. Watch him explain! “You ready @coachella ?????? I am!!!!! Game face 👊🏾👊🏾🤪🤪 let’s get it,” he captioned a hot shirtless selfie on his Instagram just before the performance.